The Belleville Senators got revenge on the Laval Rocket Saturday night as they beat their Canadian rivals 6-5 in a shootout at CAA Arena. Marcus Hogberg made 33 saves in the Sens goal while Nick Paul (2), Jack Rodewald, Filip Chlapik and Darren Archibald scored. Laval’s Alex Belzile (2), Jake Evans, Cale Fleury and Nikita Jevpalovs found the scoresheet while Michael McNiven turned away 21 shots. Tied 5-5 heading into overtime after Laval tied the game with 19 seconds left in regulation, Hogberg kept Belleville alive with an outstanding blocker save on Evans on a 2-on-1 before Paul came all so close to ending the game inside the final 20 seconds but he couldn’t shovel the puck across the goal line. Logan Brown had the lone goal in the shootout as Hogberg made three straight saves to give the Sens the extra point. Belleville opened the scoring at 6:46 through Rodewald who buried his 20th of the season from in-close after Paul had sent the puck out front from the corner. The lead last less than six minutes however as Belzile converted on the power play but the Senators would re-take the lead at 15:1 as Paul buried his 50th career AHL goal on the power play as he hammered home a rebound after McNiven couldn’t handle Erik Brannstrom’s fluttering shot from the point. Laval thought they had tied the game moments later through David Sklenicka but the goal was waved off for goaltender interference on Hogberg by Hunter Shinkaruk. The Rocket did officially find their equalizer however and it took just 1:09 into the second to happen as Evans wacked in a rebound in front of Hogberg to make it 2-2. 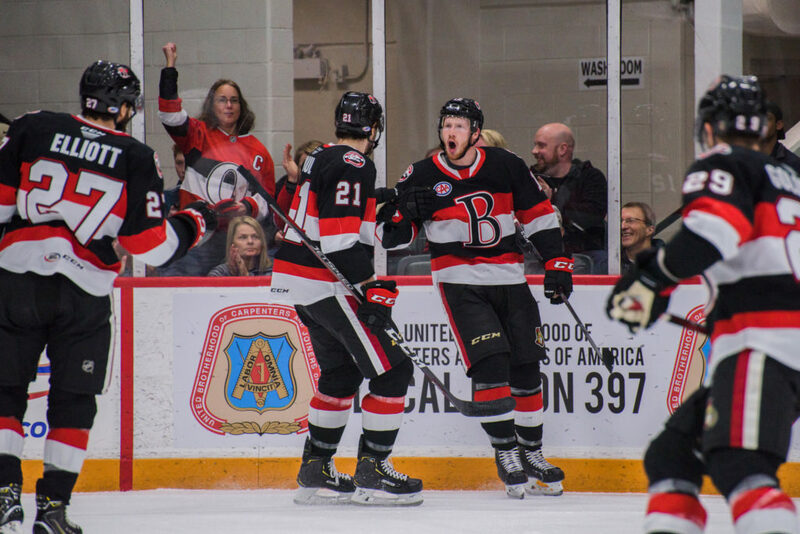 But Belleville came back strong and Paul bagged his second of the night at 3:46 on the power play before Chlapik extended the lead to 4-2 at 5:40 as he also scored on the man advantage after Brannstrom laid the puck on a tee for the Czech native. The Rocket buried its second 5-on-3 goal of the game with 6:17 left in the frame as Fleury ripped one past Hogberg from just inside the blue line for his seventh goal of his rookie campaign as Belleville led 4-3 after 40 minutes. Archibald pushed the Belleville lead to 5-3 at 10:02 of the third on a backhander that somehow found a way through McNiven as Justin Falk collected his first point with the Sens after having the primary assist. The Rocket again cut the lead to one with 6:54 to play as Belzile scored on another 5-on-3 advantage to trim Belleville’s lead to 5-4 and they tied it with 19 seconds left on the power play as Jevpaloves dispatched a rebound past Hogberg. Brannstrom’s three-point night was a career high while Paul set a new career high in goals with 16. Belleville is back in action Wednesday when they host the Utica Comets at CAA Arena. Tickets are available by clicking here.